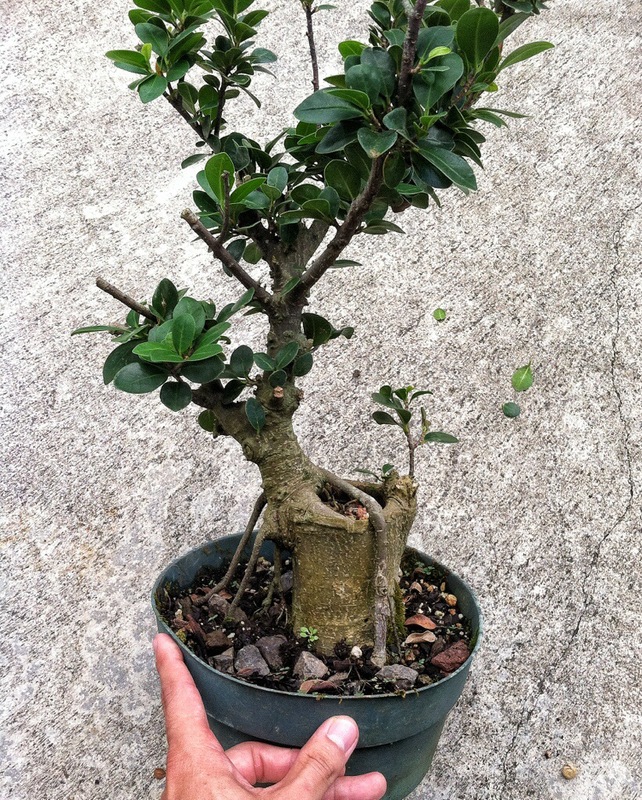 So,I get an email from Ryan, a reader from Hawaii, asking my advice on a ficus he had found at a local nursery. Just about all the pics in this post are his, except for where I drew over them. I was wondering if you’d entertain a question, or maybe more a plea for advice. 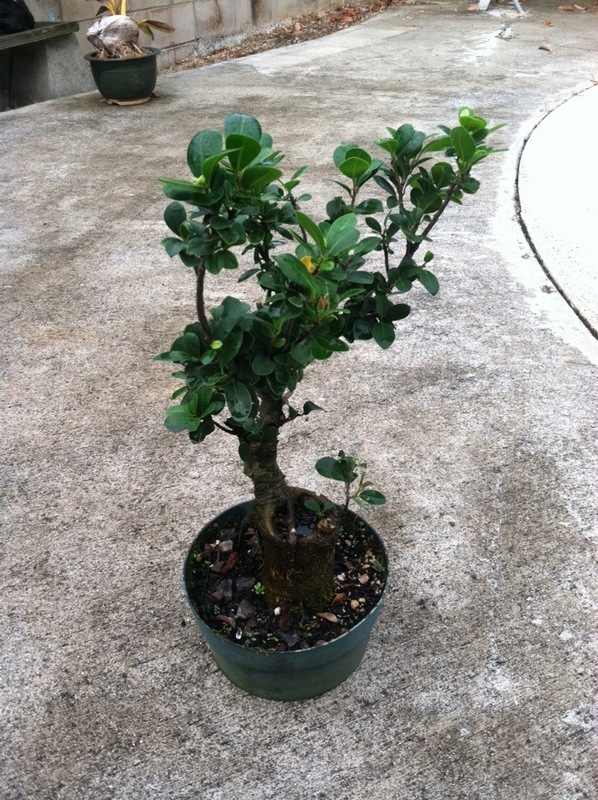 Attached are a couple pictures of a small-leaved ficus I bought cheap from a local nursery. It looks like it got chopped back HARD at some point and has a hilariously wide and awkward stump (about soda can diameter). 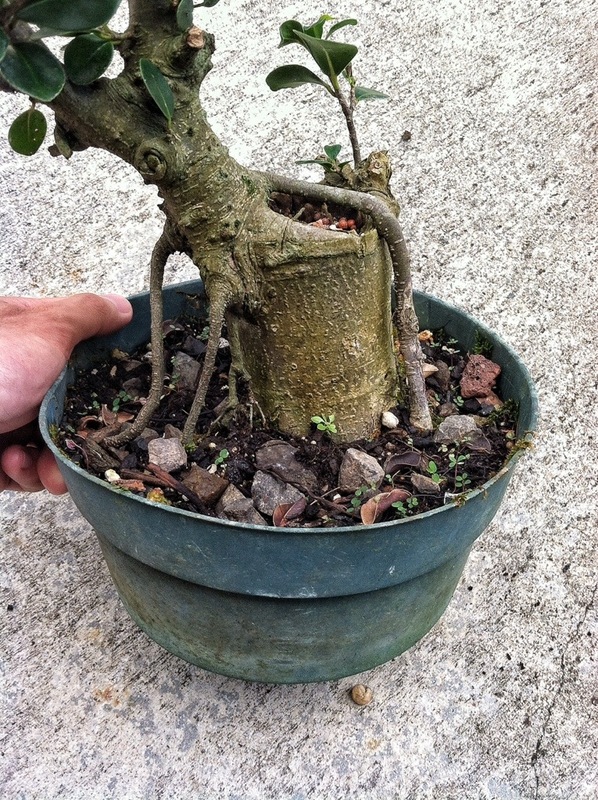 I root pruned and repotted it a few months ago and its doing well. 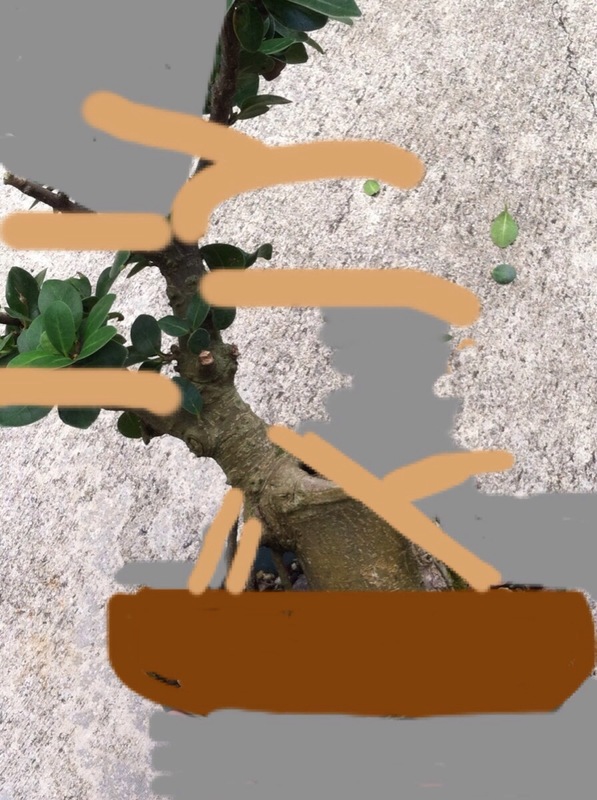 I asked for more pics and, after I got them, and had a good look at the tree, I sent him some ideas and asked if it would be ok to do a blogpost on it. 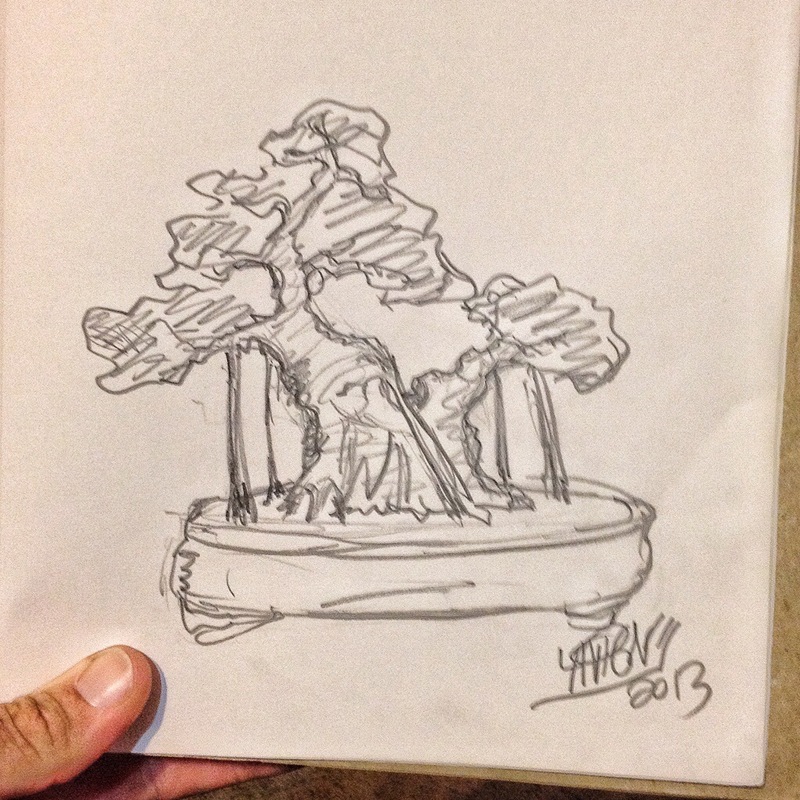 He liked my thoughts on how the tree could be done and gave me permission to write the post and, so, here it is. Look, it’s a guest hand model! I’m going to mention that Ryan is a skateboarder (which has nothing to do with bonsai but…) and he posts some pretty cool stuff on Instagram and Tumblr (his Instagram is @rmhgreer). 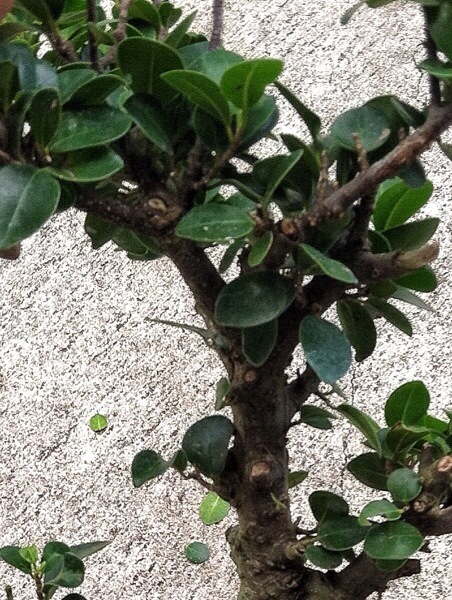 My guess as to the origin of this tree: it was probably the top of a big imported ficus that was grafted with green gem foliage that got chopped off and rooted. 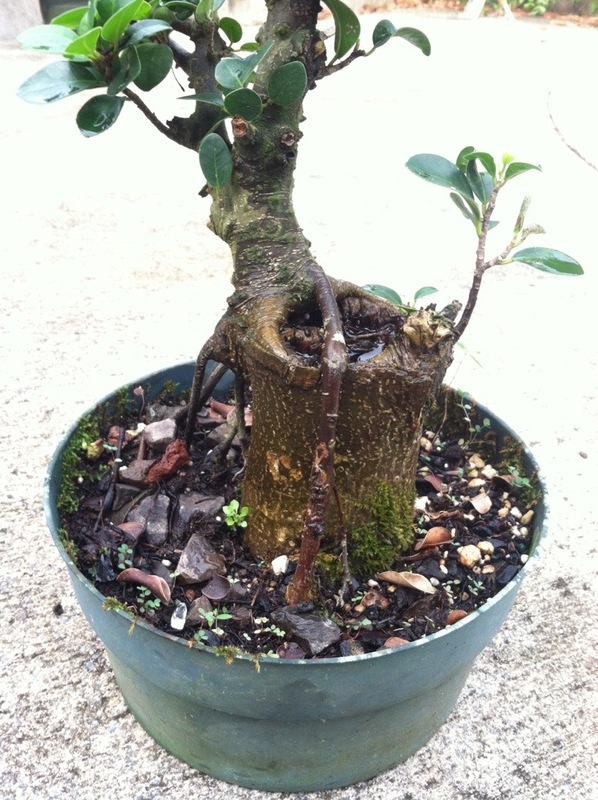 Sometimes the big tree is a standard ficus microcarpa and sometimes it is the same variety as the grafted foliage. When I said big, I meant a ficus about 4 feet tall. It takes years and years to grow those and the now the current trend is shorter trees so, the nursery will chop the tops off and regrow it (which is doable in Hawaii and here in Florida). It’s hard to tell the species of the bottom piece as the bark color on both the scion and the bottom are close. For those doubters out there, grafting is a valid technique for creating bonsai. Sometimes you just don’t get a branch where you need it. Green gem (f. Microcarpa, nitida or retusa, “green gem” is the variety) is one of the better grafting foliage as the internodes are short, the leaves are small, it gets dense and it grows fast. And the green of the leaves is just so darn green. Like emeralds. 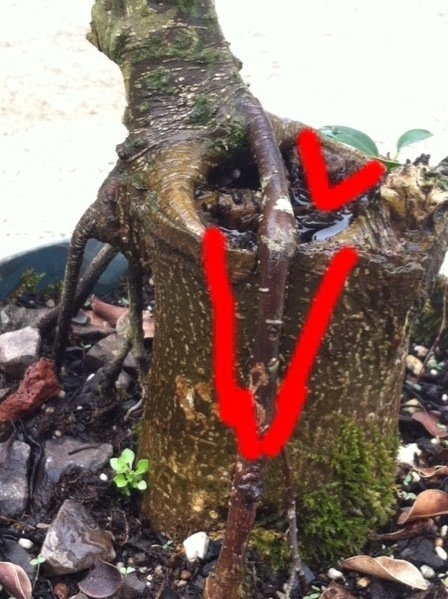 It should be tilted to the left to make the straight fat trunk appear to taper into the ground. 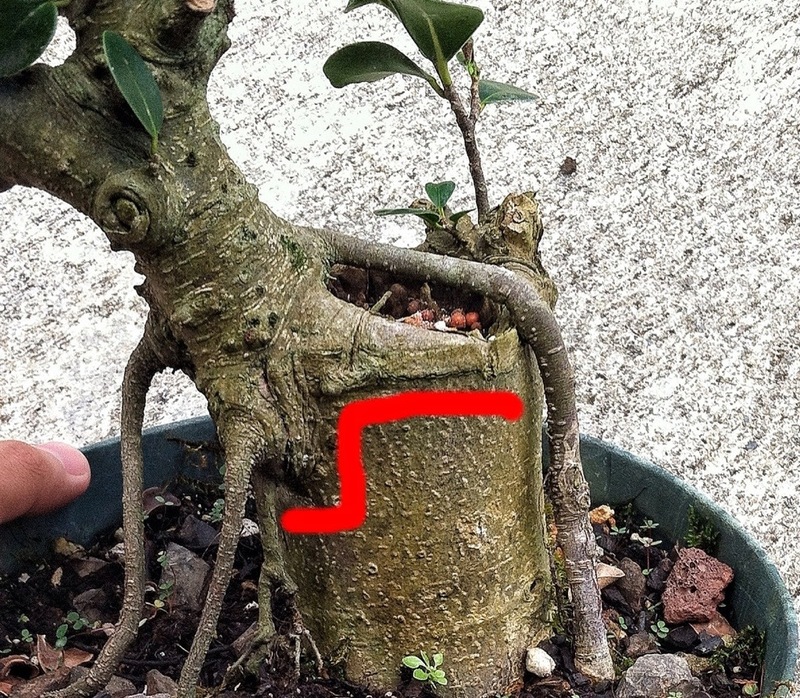 To do that, a wedge will have to be carved out of the trunk. This will give the root a place to sit (and it will fuse eventually) and it breaks up that beer can shape of the trunk a bit. To do it, uproot the aerial and just use a hand saw to cut out the wedge. Like a cake, man. A cake. If you noticed, I would also cut the top for movement and taper. 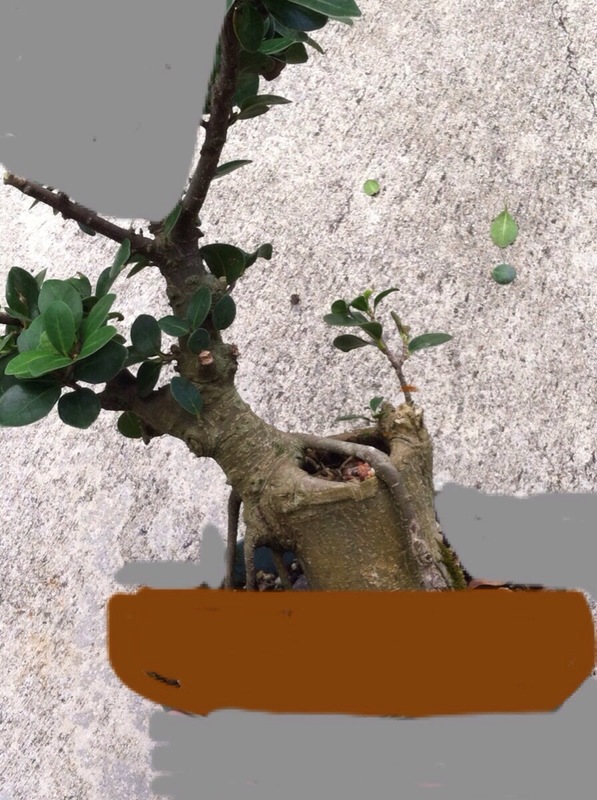 It’s beginning to look a bit like a bonsai. And I think Ryan can develop it from there. And finally, you all know that one of my posts just isn’t complete without a sketch. Much thanks to Ryan for the opportunity to do a little creative exercising and for letting me write a post on it. Really enjoy your foresight. Wish I had your eye and your creative talent! Thank you Lunetta! Thank you very much. 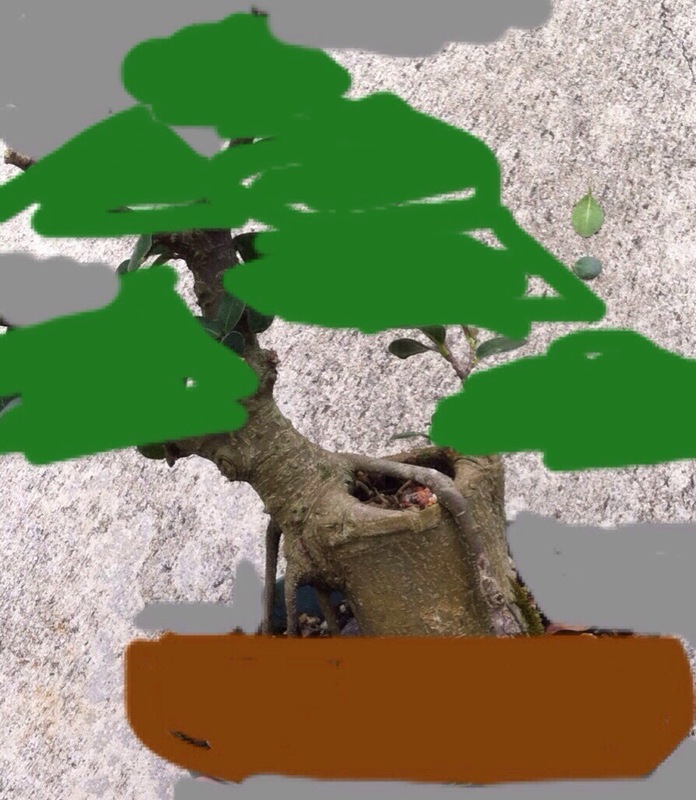 Hey, is there any Chance to see an update on this tree? I would love to see how it developed.